This Morning With sweet memories of Delhi you will leave for the city of Taj Mahal Agra (By Car).On the way of Agra you May also like to see the Birth place of Lord Krishna (Mathura).Arrive at Agra and Check in at hotel. 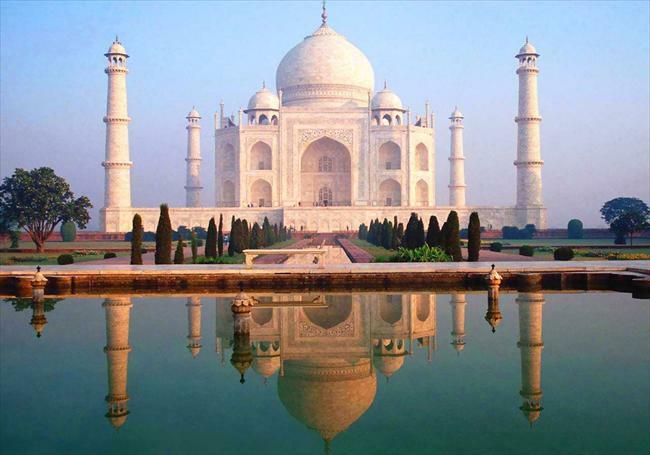 This Afternoon You will go to world wonder Taj Mahal and Red for Agra built by The Great Akbar. By evening return to your hotel for overnight. Stay overnight at hotel in Agra. Note: The Taj Mahal Remain Closed on Every Friday. The Taj Mahal Visiting Hour from Sunrise to Sunset. This Sunup After breakfast you leave for Jaipur (The pink city)and the capital of Rajasthan on the way You will Visit The new Beautiful City of Akbar Called Fateh Pur Sikiri which was founded by Akbar in 1569. After Enjoying in Fatehpur sikiri you will arrive in Jaipur check in at hotel and rest and stay overnight. On This morning After the Breakfast visit the Amber Fort and will take pleasure in Elephant Ride at Fort Amber. In the afternoon you will come to see the heritage of Rajasthan, Hawa Mahal (a palace of winds) Jal Mahal, Lakashmi Narayan temple, Jaipur Museum, City palace walk to closest Jantar Mantar an astronomical observatory. Rest of the sunset is at free time. Stay overnight at hotel in Jaipur. Today you will be transferred to Delhi airport to take a flight to Pune. for your onward journey. * Flight Pune to Delhi & Delhi to Pune in economy class.